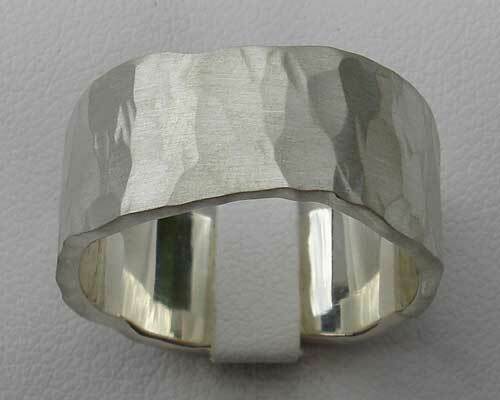 Men's Wide Hammered Silver Designer Ring : LOVE2HAVE in the UK! A lot of men like wider rings for their wedding and at Love2Have our made to order designer rings are perfect. 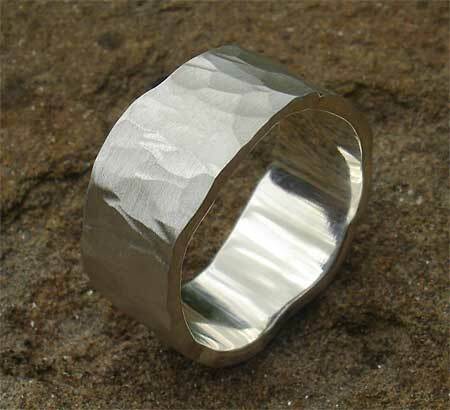 This men's silver hammered ring is 10mm wide and is the most popular of all our wide sterling silver rings. It measures 10mm in width, but as it features a slight uneven width and wall profiling, this measurement is only approximate for the entire circumference. The hammered finish is intricately done by hand on a traditional jewellers bench. The combination of this type of surface texture and rugged wall design lend this ring a very organic quality overall, and we think this is why it has become a best seller as hammered silver jewellery is popular. Due to its wide width, we tend to find this ring is more suitable for men but we also do a 6mm and an 8mm version if you need something not quite so wide.